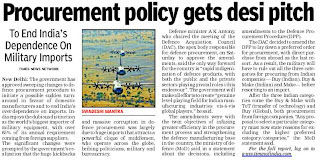 India, world’s biggest arms importer, today made important changes in its policy for new acquisitions. The Defence Ministry, for the first time, laid down top priority for locally, including privately produced, equipment, arms and weapons. The maintenance, repair and overhaul of key equipment has now been allowed to the private sector, removing the monopoly of the lackadaisical public sector undertaking. 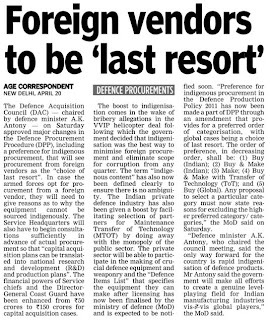 The Defence Acquisition Council (DAC) headed by Defence Minister AK Antony today met and tweaked the Defence Procurement Procedure (DPP). 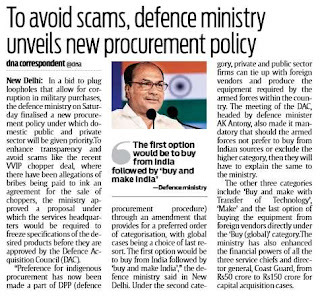 Antony, who has often spoken about having self-sufficiency in defence production, today laid down fresh set procedures that will make the ‘made in India’ stamp the first choice while ‘buying globally’ will now be the last among five options. New Delhi is the top-most global arms importer. The Stockholm International Peace Research Institute (SIPRI), in its report ‘Trends in International Arms Transfers-2012’ released on March 18 said: “India accounted for 12 per cent of all global arms transfers between 2008-2012. China was second accounting for 6 per cent of all global arms sales”. 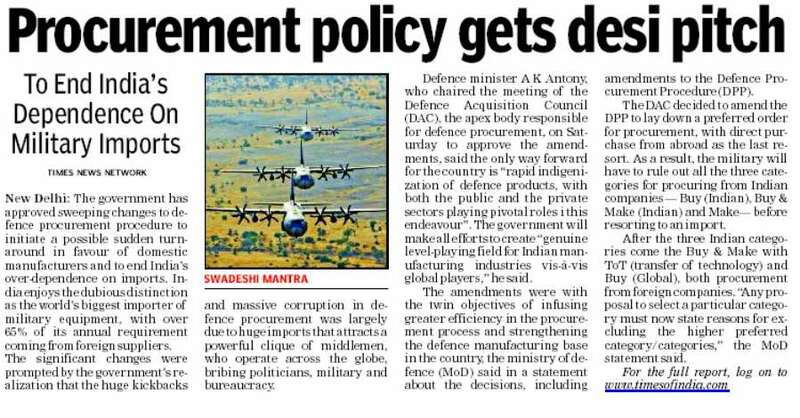 “The only way forward is rapid indigenisation with both the public and the private sectors playing pivotal roles,” Antony told the DAC, the apex decision making body of the Ministry of Defence (MoD). 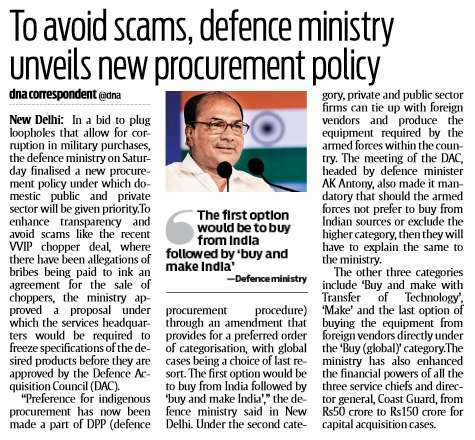 Any proposal to select a particular category must now state reasons for excluding the higher preferred category/ categories,” MoD spokesperson Sitanshu Kar said. This will include products produced by private industry in India. For the first time private companies in India will be provided a restricted version of the 15-year perspective plan document outlining the “Technology perspective and capability roadmap” for the period 2012-2027. This will guide local industry in setting up infrastructural capabilities and directing technology investments. Public sector undertakings, which had a monopoly over maintenance, repairs and overhaul of equipment will no more enjoy this. Private players have been allowed. The DAC also approved a system by which consultations on long-term acquisition plans can be done in advance so that it can be a national defence R&D and production plan rather than just buying off the shelf from a foreign country. Procedures have been changed to simplify processes. All purchases will now have a clear definition of indigenous content providing requisite clarity and a common understanding. Projects that will be under the categories of ‘’Make in India” and “Buy and then make in India” will be on priority and will see speedier decision-making from the MoD. Addressing a key concern of the domestic industry, the DAC has agreed to change the ‘security guidelines’ in place that hinder licenced defence equipment makers. For this the ‘Draft Security Guidelines’ have been circulated for consultations and this will lay down a framework for Indian private industries. 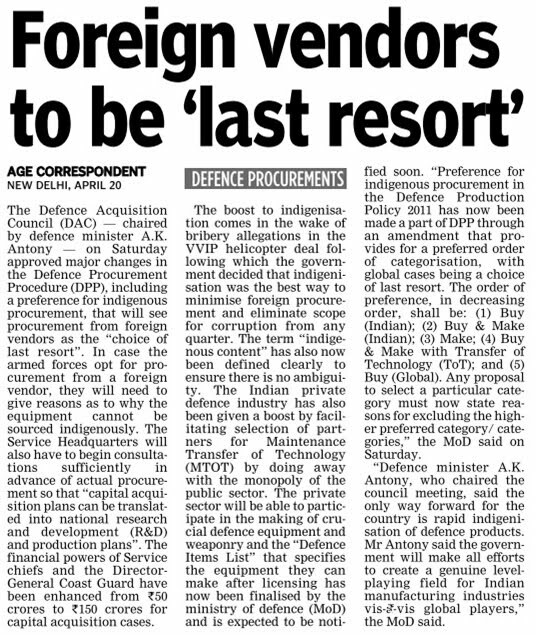 The MoD has separately taken up with the Finance Ministry the issue of providing of tax-breaks for private industry. The MoD wants to rope in more medium and small-scale industry into manufacturing. For this the SIDBI has decided to earmark an amount of Rs 500 crore for providing loans, and further, a fund of Rs 50 crore for equity support out of “India Opportunities Fund” managed by its subsidiary, namely, SIDBI Venture Capital Ltd.
India today sought to play down the recent incident of intrusion by Chinese troops at the Daulat Beg Oldi sector in eastern Ladakh, expressing confidence that the matter would be resolved peacefully between the two countries. Government sources pointed out that the two countries have for long had differing perception of the Line of Actual Control (LAC). 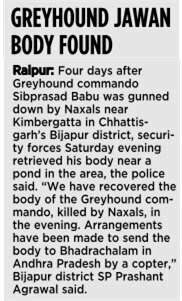 Therefore, such incidents did occur and were resolved peacefully on the basis of bilateral agreements which existed and mechanisms provided for in these accords. border affairs, headed by the Joint Secretary (East Asia) in the External Affairs Ministry and the Director General of Border Affairs in the Chinese Foreign Ministry. The border mechanism, former early last year, has held two meetings so far at which the two countries have sought to narrow down their differences over the LAC. At its meetings, the two countries have also exchanged ideas on they could deal with any incident of intrusion without triggering tension and how peace and tranquillity could be ensured along the LAC. “The latest flare up is clearly more than the usual patrol party coming into the disputed area to show its presence. 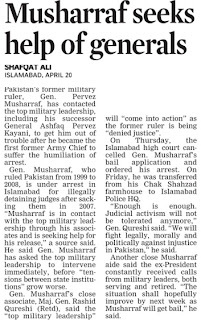 However, the existing mechanism is sufficient to resolve it,” top military sources told the Tribune. One of the ways is raising the matter at the next border personnel meeting (BPM) between Indian and Chinese commanders that is slated to be held in late May or Early June. 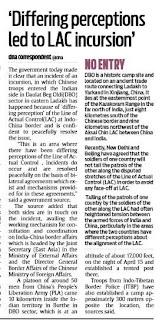 Maintaining peace along the borders, and unmarked sections of the border, called the LAC, is covered under an existing agreement of 1993. If patrol parties of either side come face-to-face, they have to follow a drill mandated under an agreement signed in 2005 which asks soldiers to withdraw without firing or accosting each other. 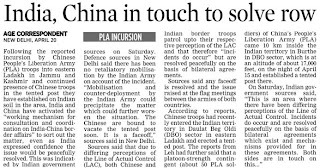 The Chinese move along the LAC is on sharp contrast to the joint statement issued on September 4, 2012 following a meeting between Defence Minister AK Antony and his Chinese counterpart General Liang Guanglie. There appears to be some disquiet in the Army as well as the Indo-Tibetan Border Police (ITBP) over the repeated incursions by the Chinese troops into this side of the border. The ITBP, deployed along the Himalayas from Ladakh to Diphu La in Arunachal Pradesh, has not been provided with an independent aviation wing to undertake aerial reconnaissance. The altitudes in these areas range from 9,000 to 18,000 feet and the temperature plummets to minus 50 degrees Celsius during the winters. The Tribune had last year reported that in the Ladakh region alone, 10 ITBP posts along the Line of Actual Control (LAC) remain cut off during the winters. The ITBP was last year baffled by over 100 sightings of Unidentified Flying Objects (UFOs) that appeared like yellowish spheres seen across the Chinese horizon near Pangong Tso Lake in the Ladakh region. 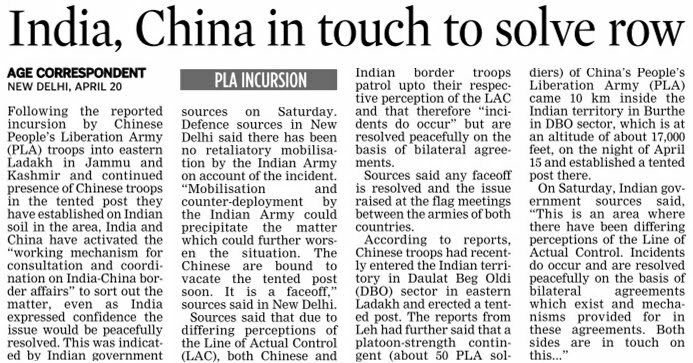 Though the latest Chinese incursion into Ladakh has again been attributed to the oft-repeated "differences in perception over LAC", a top defence source said the incursion this time was more serious. A senior ITBP officer said the People's Liberation Army (PLA) and the ITBP were in touch to check incursions and transgressions. 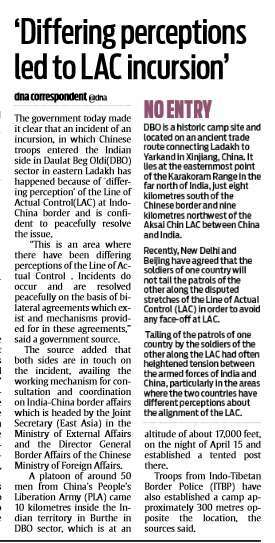 With New Delhi getting into firefighting mode, a Defence source asked, "If there is a difference in perception of the LAC, (it must be asked) how many times our troops have ventured inside the Chinese territory setting up tents, that too, inside 10 km?". The 3,488-km-long LAC between India and China runs through J&K, Himachal Pradesh, Uttarakhand, Sikkim and Arunachal Pradesh. J&K alone is marked with 1,600 km of LAC. In a deep incursion, Chinese troops have entered the Indian territory in Daulat Beg Oldi (DBO) sector in eastern Ladakh and erected a tented post, setting the stage for a face-off with Indian troops. A Platoon-strength contingent of China's People's Liberation Army (PLA) came 10 kilometres inside the Indian territory in Burthe in DBO sector, which is at an altitude of about 17,000 feet, on the night of April 15 and established a tented post there, according to highly placed sources, which said that a Chinese Army Platoon usually consists of around 50 men. Troops from Indo-Tibetan Border Police (ITBP) have also established a camp approximately 300 metres opposite the location, the sources said. Reacting to the development, government sources said, "This is an area where there have been differing perceptions of the Line of Actual Control (LAC). Incidents do occur and are resolved peacefully on the basis of bilateral agreements which exist and mechanisms provided for in these agreements. Both sides are in touch on this availing the Working mechanism for consultation and coordination on India-China border Affairs. We are confident that the current incident too will also be peacefully resolved." DBO, located in northernmost Ladakh, is a historic camp site and located on an ancient trade route connecting Ladakh to Yarkand in Xinjiang, China. It lies at the easternmost point of the Karakoram Range in a cold desert region in the far north of India, just eight kilometres south of the Chinese border and nine kilometres northwest of the Aksai Chin LAC between China and India. Temperature plummets to as low as minus 30 degree Celsius in the winters. Other than Siachen Glacier military base, it is India's northernmost built-up area. The nearest inhabited town is Murgo to the south, which has a small population of Baltis who primarily depend on apricot farming and yak rearing. From his paintings one would presume Sachin Nath has visited the battlefields which he portrays so well on canvas and which have given his works a place on the walls of some units and formations of the Indian Army across the country. Nath, 71, has an uncanny ability to faithfully portray on canvas stories of bravery soldiers narrate to him. His gigantic paintings on the Battle of Longewala, the surrender at Khulna, Meghna river crossing, Presidential colour presentation to a Mahar unit to name a few, can be seen at Indian Army units, including many at the National Defence Academy. He has brought these milestones in Army history alive through his works. For those who do not expect fluent portrayal of military life from an artist, Nath comes as a surprise, which lasts only till one gets to know that he retired in 2002 from the National Defence Academy (NDA), Khadakwasla, as senior arts instructor. He has been painting since 1962. 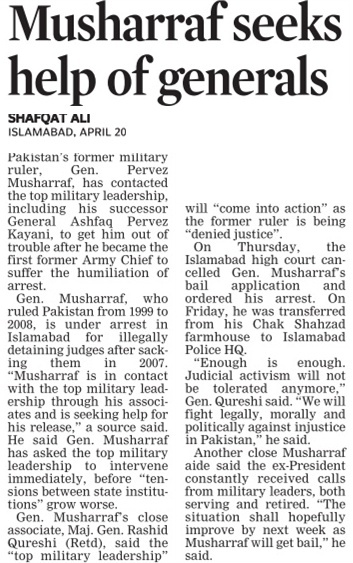 For a man who started his career with a dream to become an officer in the Army, the turning point was quite accidental. He says, "At the age of 14, I worked as a signal boy and was shifted to Military Training Academy (MTA) at the age of 18. I wanted to be an officer, but it was my commanding officer who brought colours in my life. In one of the reunions, my CO gave me the task of creating a replica of the Red Fort. A Jabalpur Area Art Competition, and some national competitions later, I became an artist." He came to Pune in November 1961 and the very next year started teaching art to cadets at the then Officers' Training School (OTS) started for emergency commissioning of officers in light of the 1962 Indo-China war. Ministers are being accused of doing too little to curb the Army booze culture that often triggers violence among soldiers, the Sunday People reports. Alarming figures published in medical journal The Lancet show more than one in five former and serving troops under 30 commits violent crime. But shadow Armed Forces minister Kevan Jones said more should be done to combat drink problems among soldiers. A study of 13,000 serving and retired Armed Forces personnel was conducted by the King’s Centre for Military Health Research. It found that serving in Iraq and Afghanistan was not a direct factor in violent offending. But there was a link between combat and alcohol misuse, anger or post-traumatic stress.